A MAJOR five-year plan to cut "preventable tragedies" caused by road crashes was launched yesterday in Co Donegal. The Donegal Road Safety Plan 2016-2021 aims to improve road safety for all road users in the county by harnessing a multi-agency approach involving education and awareness; garda enforcement; road engineering and evaluation of progress. The plan is produced by the Donegal Road Safety Working Group, an interagency group consisting of Donegal County Council, Transport Infrastructure Ireland, An Garda Siochana, Road Safety Authority, Donegal Youth Service, Donegal ETB, Pro Social Drivers Programme and the HSE Ambulance Service. These agencies meet on a monthly basis to develop and implement road safety initiatives and campaigns. Some of the initiatives include promoting cross border co-operation on road safety, continuing to develop the road safety road show, review speed limits in accordance with national guidelines and legislation, high visibility enforcement targeting errant road user behaviour, drink driving and the non wearing of seatbelts. 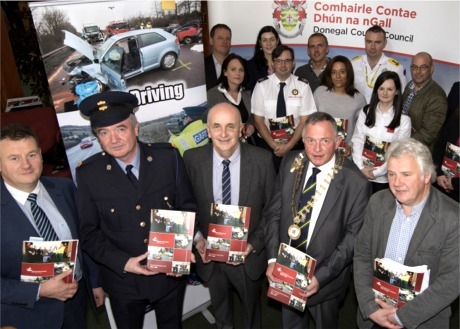 At the launch of the Donegal Road Safety Plan 2016 – 2021 at the County House, Lifford, on September 19, 2016 were front from left: Seamus Neely, Donegal County Council; Inspector Michael Harrison, An Garda Siochana; Brian O’Donnell, Donegal County Council; Cllr Terence Slowey, Cathaoirleach and Philip Durcan, Transport Infrastructure Ireland with members of the Donegal Road Safety Working Group and Donegal County Council. Council Cathaoirleach Cllr Terence Slowey said: “Donegal County Council has an important role to play in promoting road safety and the Donegal Road Safety Plan 2016 to 2021 will focus on the reduction in road collisions through Education, Enforcement, Engineering and ongoing Evaluation. The plan also seeks to encourage every member of the community to play their part in reducing road collisions by taking responsibility for their own behaviour as road users. The Donegal Road Safety Working Group at their monthly meeting will monitor the plan's progress and "review indicators that will measure the activities under each relevant objective". The five-year plan can be downloaded under the 'Publications' section of www.donegalcoco.ie .